Morning light crests an impressive canyon and lights up the mist generated by Palouse Falls, Washington. Sometimes we don't get what we want.. or what we worked hard for. Sometimes the best option is the one we thought about the least.. and the one that's right there in front of us. I was reminded of this fact when I took this non-typical image of 198 ft. Palouse Falls. I spent the majority of the 15 degree winter night and early morning perched on very edge of a 275 ft. cliff, being careful to not misstep on the icy ground. 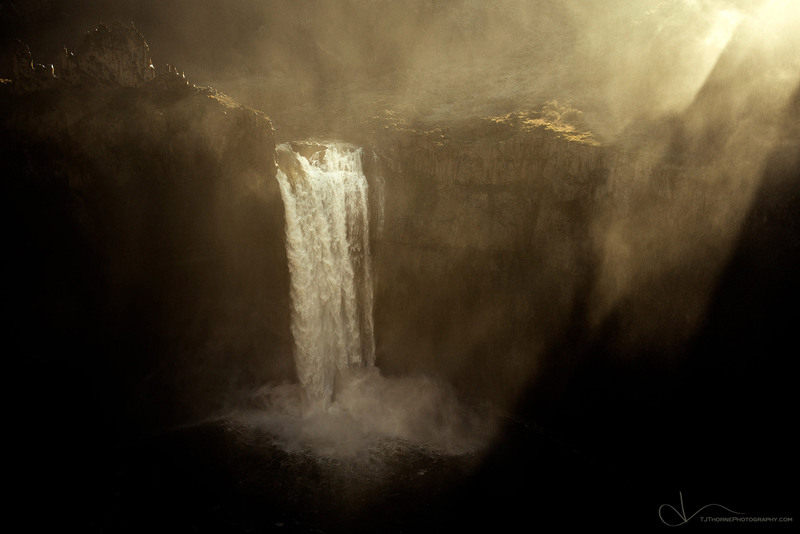 The freezing mist of the falls covered my clothing, camera, and exposed skin, making the task of getting a clean exposure a lot of work. My fingers and toes were frozen and the howl of coyotes was just a little too close for the comfort of the mind. I'll never forget those sensations. I welcomed the beginning of a new day in the same spot, hoping for a glorious sunrise over the deep canyon and falls. The glory never happened. But the warmth of the sun cutting through the cold air was invigorating for body and mind. I packed up camp and on my way out, took in a final look from the viewing platform. The mist being illuminated by the early morning sun cresting the canyon walls communicates a different glory I found, and a rare and nonchalant hand-held shot from the viewing platform did the trick this time.